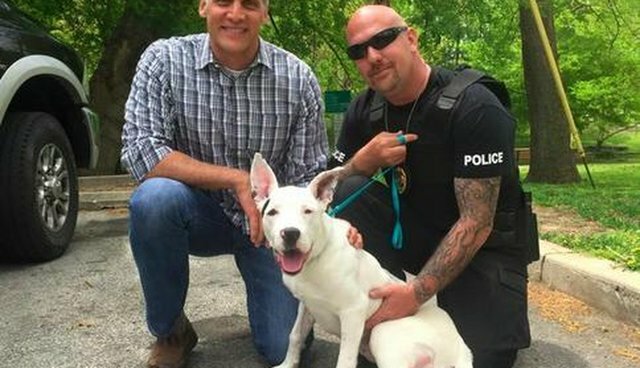 Frank is such a loving and forgiving dog that even after being shot five times at close range, he was still all kisses and snuggles while hanging with the cops who rescued him last week. 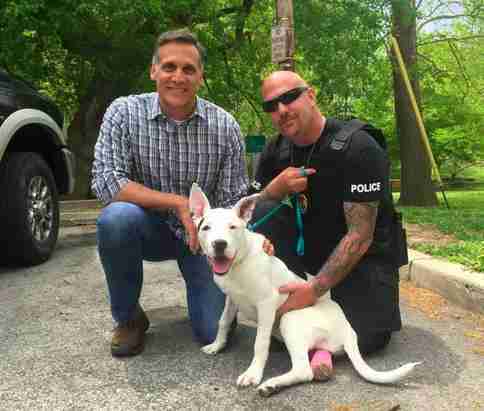 The 8-month-old pup was known around his Chester, Pennsylvania, neighborhood as a friendly stray - locals regularly left food out for him. That's why everyone was shocked when some terrible person decided to shoot Frank. "We heard several shots, like rapid-fire shots - 'bang, bang, bang.' We came outside and the dog was bleeding everywhere," Saleem Trader, a resident who knew Frank, told local news outlet WPVI. Despite his injuries, Frank happily greeted his rescuers. 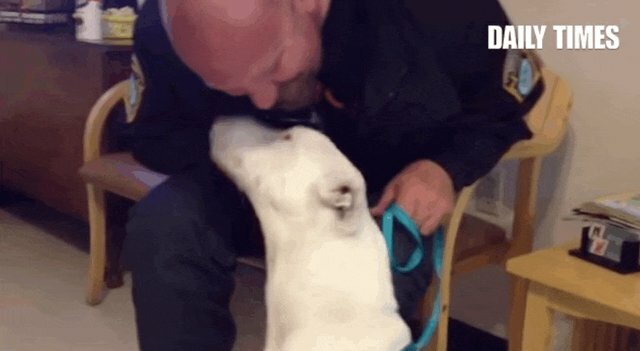 He had emergency surgery at a nearby animal hospital, and a video taken last week shows an upbeat Frank giving smooches to one of the officers who rescued him. Frank is currently in the care of a foster family through Justice Rescue, and the search is on for the cruel people who shot him. The rescue is currently fundraising to cover the costs of Frank's medical care, which vets estimate will run about $20,000 by the time he's in the clear. Hopefully by then Frank's abuser will have been brought to justice, and he'll be well on his way to finding a forever family.